I begin by thanking: Kat Burdine, Lauren Davies, Elizabeth Emery, Sarah Kabot, Amanda King, Kelley O’Brien, Jessica Pinsky, Noelle Richard, Julie Schenkelberg, Corrie Slawson, Barbara Tannenbaum, Christina Vassallo, and Megan Young, who were generous with their time and words. 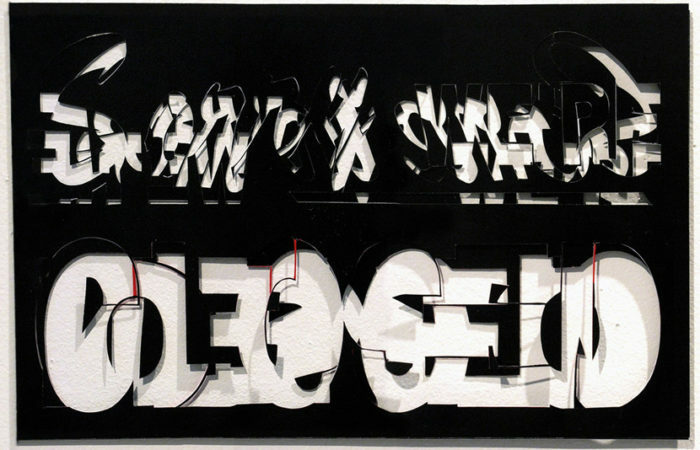 Sarah Kabot, Open Closed, Closed Open, 2009; plastic signs; 8.5 x 11 in. Last June and July, I was in Cleveland as the SPACES 2018 Art Writer in Residence. When acquaintances ask me how the experience was, I generally say, “It was great!” And it was: I spent a month in a beautiful, complicated, historically fascinating city, surrounded by intelligent, hardworking members of the arts community; and in the opening days of the FRONT Triennial, I saw over twenty exhibitions, most of them excellent. My stay in Cleveland was also sometimes uncomfortable. Though my contract with SPACES was extremely open-ended, and the final outcome could be as experimental as I wished, I found that there was an enormous (internal) pressure to make something thoughtful from my time there. To not, in the words of one artist I met, “produce something totally… glossy.” But is there a way to arrive in an unknown metropolis — literally drop out of the sky into new territory — and make sense of an entire art scene in four weeks? Parachute journalism, and its kissing cousins the Roundup and the Listicle, are how we end up with fluffy, irrelevant, and maddening misrepresentations of entire arts communities. Still, I wanted to try to understand the different aspects of artistic life in Cleveland. My pre-arrival research had revealed a promising (though rough) notion: That a city that gave the first land grant to a woman in 1798, formed a Greater Cleveland Congress in support of International Women’s Year in 1975, and houses the International Women’s Air & Space Museum might be an intriguing place to explore what territories — literal and metaphorical — women occupied. My interest in this notion intensified as I read one #MeToo article after another. Over the course of my residency, I talked with more than a dozen artists, curators, and arts administrators, all of them identifying as women or non-binary. Christina Vassallo: Many of the nonprofit arts organizations here are led by women — it’s astonishing, actually — and a lot of the galleries too. Socially, however, sexism is still writ large through policymaking. To give you one example, the insurance premiums in Ohio for women of my age group — childbearing age — are much higher than a man’s premiums of the same age bracket, which then incentivizes companies that share premiums to hire men. Barbara Tannenbaum: In 1985 I became the chief curator at the Akron Art Museum, and I did that for twenty-six years. Seven years ago I came to the Cleveland Museum of Art as curator of photography. I’ve been lucky that I’ve been at two institutions that understand the importance of representing a diverse population of artists and serving the diverse populations of their communities. I’ve always made it a goal, even when I was teaching in graduate school, to include women and various minorities. That’s been part of my curatorial practice all along — certainly inspired by the period I grew up in, but also my PhD advisor was very good, so I had an example there, a good model. I guess I never considered that it could be any other way. Over the course of the month, one of the things that kept coming back to me was the performative nature of the whole setup. The arts workers I met wanted to show me their best work and selves; and I understood this reciprocally, since I wanted to seem likeable and competent. There was something about having a month-long spree of one first date after another that threw the social dynamic into high relief: We wanted so much to collaborate, if only for the span of a conversation — to find shared values and meaning. Words were chosen carefully. And yet I never felt that anyone was less than radically honest with me. Christina Vassallo: There are so many artists and arts administrators here who have families. Part of that is the intergenerational “stickiness” of Cleveland — their parents and grandparents are still here, so they have a built-in support network. People here can afford houses, they have space. It’s a major win for the city in terms of addressing feminist principles. But if we’re talking about intersectionality, I think we are behind the curve here because it is one of the most racially segregated cities in the US. Noelle Richard: There is a community, but it’s really small. What if I want to see a show that doesn’t include anyone I went to school with, or any faculty? I wonder what kind of light nepotism is going on. I get worn out by feeling like I’m having the same conversations. And I wonder what kind of opportunities there are to show the kind of work that I’m making. Kat Burdine: It would be nice to have more conversations in which people weren’t afraid to participate. There’s a lack of back and forth, and that has affected my personal practice in a way that was unexpected. In Detroit I had a community that was challenging, they were breathing it in and out. The gay community is not perfect, it’s something to be studied and thought through; just because it’s a minority doesn’t mean it’s untouchable. 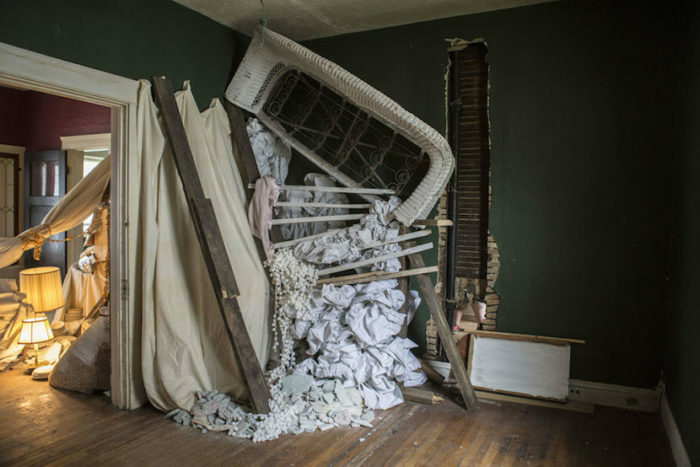 Julie Schenkelberg, Slavic Village, Abandoned Foreclosed Home Project, Rooms to Let, 2014; mixed media; 9 x 6 x 7 ft.
By the time I finished transcribing our conversations, I had over 20,000 words. From that glut of information, it seemed both impossible and reductive to the point of worthlessness to try to distill my experiences into a singular vision. One conversation overlapped with another in a way that felt almost choral: I was listening to an ensemble of vocalists whose individual pronouncements went in and out of harmony with each other. Megan Young: I have two children, I don’t make much money, I spend a lot of time on my art practice, and not making objects for sale. A lot of my work is counter to market values and that’s part of the intention, and I can do that in Cleveland because I can live very cheaply. Amanda King: Cleveland is affordable, you can definitely live pretty well here. But it’s relative. I can’t speak to that security when I’m economically vulnerable. My life is expensive because I have people to worry about. Starting up an arts program where it’s important that people get paid — especially Black kids, to be compensated for their work — that means oftentimes I don’t take a cut off the top. If I say, “You get $250 each for this project,” I have to make sure they get that $250. So if we get $1000 for a project and a camera breaks, and it costs $250 to repair, whose pay is getting docked? Not theirs. Mine. If they’re not paid and feeling secure, I’m not feeling secure. Most of my work as an artist-activist is centered around volunteer policy work and community work — that takes so much time, and that takes me away from money-making ventures. It’s very expensive for Amanda King to live and to exist. I don’t feel security here. Period. Elizabeth Emery: The reason I left my former studio in an industrial space was that the landlord was this crazy sexist dude. And I thought, this can’t be part of going to the studio, dealing with this guy — or avoiding him. Also, I was afraid that I would be preparing for a show and he would be like, “You’re out of here next month.” I feel really lucky to be in Cleveland and be able to buy my own place and set up my studio. I hadn’t really thought about it in terms of being a woman, but it totally gives me a sense of security. I don’t have to worry about this sexist guy, his insanity and his negative energy, and I do not have to worry about being kicked out. I was impressed with these artists, who had sized up the situation with clear eyes (relatively affordable real estate, no art market, etc.) and decided that the hindrances were outweighed by the advantages. No one thought they were going to be an art star in Cleveland, and in a profession that often seems governed by transactional connections, no one approached me with the profound insecurity and desperation that afflicts many artists. When people talk about how “nice” the Midwest is, maybe they mean that their relationships aren’t governed by a suffocating ambition. Lauren Davies: I like being an artist here more than I did in California, where I lived for decades. I feel completely liberated to do whatever I want to do. Everything feels easier for me in terms of being an artist; it’s just not a financial struggle like being in California. And I have access to people here in the stratosphere of the art world that I would never had access to in San Francisco — people at that level would have never given me the time of day. But there is no market, and there aren’t that many places to show – everyone’s just doing what they’re doing because they love doing it. And therefore the community is more welcoming. Jessica Pinsky: I feel sheltered from the fact that this is a male-driven world. There are so many female-run galleries and you have a lot of strong, incredible women curators. There are a lot of women in every aspect of the art community here, and they are thought of in a very equal way. There’s not a huge buyer market here. Artists living in Cleveland are not driven by sales, so we feel more at liberty to experiment. So let’s make art for art’s sake and collaborate, talk to each other and support each other. Corrie Slawson: I own my studios, they are in my house. A large commission allowed me to buy a press and put in an exposure unit. You can live in Cleveland and own your little plot of land. That said, I show my work but it’s hard to get it out. I’ve had conversations with my friends from Parsons, and they’re like, “The fact that you can even conceive of owning your own home and studio space, the fact that you could even conceive of starting a manufacturing business, is not something that I can conceive of.” They say, “I have a studio in Brooklyn, I’m lucky.” And I’m like, “You are! You have people going through your studio who will never see anything that I make.” So there is that. Nevertheless, apprehension about my role acted as an irritant to the flow of these interactions. Was I to be an exporter of the culture? A dutiful summarizer? I don’t consider myself a journalist, nor am I an art historian; I’m an artist and a writer, spending time among artists and writers. What I wanted to arrive at was something that would reflect the performative nature of our interactions, and respect the viewpoints that came through so clearly when I read through my transcriptions and notes. Kelley O’Brien: Maybe because we chose to live here — we’re not Ohio natives, or returning natives — we’re much more critical and vocal. You’ve got to make your own space in Cleveland. You have to be proactive and define it: This is me. Some see criticism as an attack. I’m not afraid to say some things, but maybe I offend people. Of concern to me was (and is) the question of service: How could my time in Cleveland be useful to these arts workers, many of whom I now think of as friends? How could I serve the greater goals of the community? Is this piece of writing in service? Perhaps not in the professional-gains manner of a slick write-up on an individual artist, but, I hope, in a way that reflects a generous community’s honesty back to them. Now as then, my thoughts circle back to what artists and art communities need. Most answers revolve around money, or at least the things that it can buy: shelter and food, health care, transportation, studio space, materials, and enough time to make art. But we also need attention, cooperation, collaboration, and skill and information sharing. How and when we listen to each other matters. Once basic needs are met, the thing we require — and frequently crave from each other — is care. As a woman artist working out of my home studio, and a founder of a small non profit Gallery in Shaker Heights, I thank you for sharing your candid opinion, knowledge and honest experiences.